During the past few decades, deep-sea research benefited greatly from a number of newly developed, highly sophisticated exploration techniques and comprehensive datasets, thanks to the immense industrial interest in deep-sea sediments. 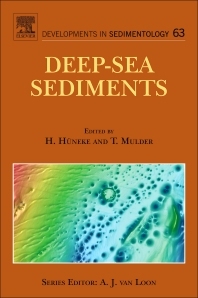 The book Deep-Sea Sediments focuses on the sedimentary processes operating within the various modern and ancient deep-sea environments. The individual chapters track the way of sedimentary particles from continental erosion or production in the marine realm, to transport into the deep sea, to final deposition on the sea floor. The sedimentary processes cover several types of sediment gravity flow and contour currents, pelagic settling and hemipelagic advection, planktic and benthic bioproductivity, and volcanoclastic sedimentation. In addition, the relationships between depositional environment and endobenthic organisms as well as early diagenetic processes at and within the deep-sea floor are dealt with. Facies models of the wide range of depositional products hold the key for a process-related interpretation of ancient deposits. Changes in sea-water chemistry, major innovations in organism evolution, and changes in external controls on sedimentation and productivity are discussed in the context of overarching trends in ocean history. Deep-sea sediments are not only of interest because of the numerous interacting processes involved in their formation, but they represent also a nearly inexhaustible archive of long-term climatic changes. Consequently, the book also includes an introduction to the climatic interpretation of the various proxies that reveal global changes during the Mesozoic greenhouse and Neogene icehouse conditions. In order to address the specific interest of the oil and gas industry in deep-water sediments, the investigation techniques that are applied in this context and the methods to predict both the occurrences and the characteristics of hydrocarbon reservoirs are included as well.